Because we have to be ready for pick-up by 7:25 am (by far the most precise time given on this trip), we have to be at the hotel restaurant when it opens at 7am. So, I set my alarm for 6am and didn’t get a good night’s sleep because I was afraid of not hearing it. I remember checking it at 1 am, 3:20 am, 4:40 am, and 5:59 am. Pretty much every 80 minutes. And our air conditioning was cranked up, so the blankets felt realy good and made getting out of bed even more challenging. We made it to breakfast a few minutes early. The stereo was playing Talking Head’s “Road to Nowhere”, Abba’s “Momma Mia”, and Queen’s “Bohemian Rhapsody.” Along with getting my ‘80’s fix, I had 3 glasses of iced mate and a cup of coffee. This is where we're going today: Iguazu Falls! Upstairs in the lobby, we were waiting for our guide to show up at 7:25. She was late, but it was okay because of the entertainment provided by another guest. She was in her late20’s or early 30’s, overweight and wearing one of the least flattering zebra pattern camisole tops I’ve ever seen. She was also Hispanic, but didn’t speak and Spanish so we were able to overhear that she didn’t want to go to the falls today. Because it was raining. She even went so far as to ask if it was raining on the Brazilian side. Which, I suppose makes complete sense if you have no understanding of weather, rain, geography, or waterfalls. If you don’t want to get wet, don’t go to a place with 70% humidity that also has the type of geologic formations which cause water to fall down and turn into a spray or mist. Especially one the size of Iguazu. Our guide, Julia, found us and we were lucky enough to be in the same tour group as the woman at the hotel. But we were on the same tour as two Germans we’d flown in with as well. Julia did her best to keep everyone together, but that meant being very slow. The first path we took was the Upper Circuit. Our viewing platform was made from the same perforated metal that the kilometer-long walkway to it was built from. Apparently, it’s replacing the concrete walkway that washed away in a 1992 flood. I think that the new idea is to let water flow through the grating instead of around it. There is a serious amount of water flowing into the “Devil’s throat”. There is also a cool breeze blowing as we approach the edge. Down below us, we can see the black silhouettes of the swifts that are a symbol of the park. They’re darting in and out of the mist whenever a cloud of white water rises up and blasts us with a warm spray. Then the cool breeze passes over us, after which more warm mist, etc. The winds felt like they were up to 20-30 mph. The water’s smooth and black until it reached the vertical brown rock face that’s covered with lush green bushes and plants that lived of the airy white spray that was created as the water was channeled through stone parapets. The bottom of the falls were obscured by clouds of silvery mist. We reboarded the tourist train to travel to the stop where an hour earlier, Julia had all of us in the tour disembark the train because she thought she’d left two people behind… and turned out to have been in the last car, which allowed us to reboard and visit the first waterfall. Julia started talking about the local plants, but the group was moving too slowly so we followed the Germans’ lead and broke away on the way to the lower circuit. The other tour groups have now arrived at the park and clogged it up with stupid people. The worst are the middle-aged to elderly women who insist on smoking right in the middle of an otherwise scenic view. The trick we’ve found for the avoiding the tour groups is to keep inside the 10-15 minute intervals where there aren’t any people around. The lower circuit gives a good view of the falls without looking down on them. Every so often, we pass by a hole in the rocks that must be 50-60 feet deep and totally empty. One small waterfall (there are dozens or more) looks like it’s hung with white and green striped curtains; the less airy the water, the clearer and greener it is. It was getting to be around lunch time, so we figured that it was a good time to take the boat ride up to the falls while the tour groups ate. There were two options: A 12-minute ride or a longer ride accompanied with a 4x4 drive through the jungle. Since it’s been raining off and on all morning, the idea of mudding didn’t sound all that great. Our boat went up to the middle of the Devil’s Throat, but not far enough to feel surrounded. You can see people on the Brazilian side, and I don’t know if they can take the boat any further because of border control issues. The boat is under-powered and struggling to keep even with a spot on the shoreline. The captain whipped the boat around like a top and we drifted down the river a bit. Our guide is the most suavely-dressed riverman I’ve seen. His coordinated yellow life vest is matched to his polar fleece under the gunmetal gray drysuit that matches his mirrored sunglasses. His hair is slicked back and the small band-aid on the left side of his forehead looks like it’s an accessory for that ‘tough and ready’ touch to his polished façade. On the boat and into the mist! We drive headlong into the next set of falls, the whole world becomes a wet whiteness that soaks and blinds us like a thousand fire hoses set wide open. The cascade sounds just like rolling thunder right now. The only way to keep my eyelids from getting ripped off by the force of the downpour is to close them and blink them open. All I see are red lifevests and the yellow slicker of the cameraman in the bow…everything else is white. It’s like a cartoon where the background was never drawn. We return to the steep rock staircase across from the falls, where we climbed out thoroughly soaked through all of our clothes. I’m very glad at this point I’m wearing all synthetic or quick-dry clothing. We immediately board another boat over to Isla San Martin, which sits between the falls. So that there is no doubt, the flag of Argentina is flying high above the beach as we land. A heart-pumping series of wet stone stairs winds its way up the island, so that we are on the middle level of the waterfalls. The falls from the upper level are a ways away, but they flow towards us to rejoin each other just before falling over the edge mere feet away from us. There’s an Australian lady taking a photo of her daughter’s Care Bear next to the falls. So I did the same with RRR. On the backside of the island path, we saw some birds with dark blue-black heads and golden bodies. I think they’re jays, but ‘custom-painted’. Also, off the island and before the boat trip, we saw some wild coatis, which look like a raccoon-opossum hybrid. They were walking down the handrails of the pathway and who knows where their little paws have been. We left the island and walked back through the park, stopping for soda and cookies. It’s 2:30 and that’s all we’ve eaten today. Rather than take the train, we walked the Sendero Verde (Green Path) back to the information center. I bought a T-shirt for $6 USD. I feel kind of silly weaing it right now, since the rest of my clothes are still soaked. Our tour bus dropped us back at the hotel where we hung up our clothes to dry and went out for dinner. Taking a different route than last time, we walked through the non-tourist streets in search of food. We saw a white dog covered in red earth laying next to a pristinely cleaned Siamese cat whose intense blue eyes followed us down the sidewalk. We ate dinner at an outdoor restaurant with ambient music similar to the stuff Enigma puts out. I had a spicy beef shish kabob in the Guarini style, some appetizers, another caipiriña, and a dessert of flaky layers and dulche de leche with an Argentinean cappuccino. By the time we finished dinner, we couldn’t move for half an hour. We did a little shopping, then walked back to the hotel while dodging locals selling jewelry displays on blankets spread across the sidewalk. I had to pass them again on my quick trip to the maxi kiosk to get some bottled water and more pomelo soda. My clothes are still drying out, scattered across the room on hangars mounted to any ledge I could find that would hold them. We’ve been hearing interesting music here. Shakira, in English (what’s up with that?) and “The girl from Ipanema” in Spanish. Our air conditioning is blasting because it has no metal control knobs, only the metal stamps that they sit on. If we want it turned off or on, we have to call down to the front desk and they will send in someone fix it. I’m not sure why they won’t let us do it ourselves. The German tourists that were at the Boca Game we went to have confirmed that we did actually see Maradona in the stadium /blog/ at the game yesterday. Slept in, woke up, then slept in some more. Breakfasts here have been lackluster, not really worth getting out of bed for. I think it was around 11:30 when I was trying to cram all of my stuff back into my pack after gradually exploding across the room during the course of the last few days. The bag definitely feels heavier from all the papers and maps and souvenirs. My backpack almost looks like it’s just about ready to give birth to a little baby pack; I guess that means the developmental/reproductive cycle of a backpack is about two weeks. We hopped into the elevator and filled it up with just the two of us and our packs. There’s not even enough room to turn around, so we made faces at each other in the mirrors. After checking out of the hotel, we hired a remise for our ride to Buenos Aires’ domestic airport. Our driver tried to make chit-chat, though he had a peculiar pronunciation for the candidates in the upcoming U.S. presidential election: “Estados Unidos? Bush or Kay-Ray?” That said, I couldn’t tell you who was running Argentina at the moment. At the airport, check-in went smoothly. Kacey was still doubting that we’d get tickets to Iguazu based on our experience getting taken care of so far, but we did. Lunch was a luke-warm rice and steak at the food court. The next table over, there was an English-speaking high-school rugby team on tour. That could be fun. I pulled out some more cash at the ATM and we sat drinking coffee until we decided to walk over to our gate. It’s still somewhat early for the flight and the only people here are a woman, her little daughter, and her young sun who is entertaining himself by keeping a small yellow balloon airborne. He’s too short and not strong enough to hit it over the 2m glass wall between the gates, but that doesn’t seem to keep him from trying. We boarded a transfer bus that took us to our plane bound for the Iguazu Falls. I began the day at 6am by catching up on my journal writing. I’ve been running a day behind, though I almost got up to the /blog/ the game by the start of breakfast at 8:30. We were on our way at 9am to the port for a day trip to Colonia del Sacramento, Uruguay. Based on our info from last night, there is a fast ferry at 11am, but we have to be there an hour early for processing. We found the terminal at 9:45, at which point we started the ticket process. The first stop was what looked like an information booth. He directed us to a desk labeled “Venda” where we told them that we wanted to go out on the fast boat and come back on the slow one later in the day. He told us to go back to the info booth to pay. Info guy asked if it was only one-way. Apparently we weren’t clear, so we went back to Venda-man, who got replaced by Venda-woman, who sent us back to Info guy, where we paid for the tickets. Then we had to stand in line to check in, because buying the tickets in person an hour before the trip doesn’t imply that you’re present for the trip. After check-in, we breezed through the metal detector. I had my camera, watch, and change on me but it didn’t go off. Great security. Next stop, customs/immigration. Breezed through there too. We were in the waiting area at 10am. In the waiting area, somehow a brown bird got inside the glass. It’s hopping around under the gray seats pecking at golden crumbs on the blue carpet. There are some seriously old folks on our boat. I overheard one lady with a slight lisp on her “r’s” talking about photoshop and Hi-8 video. Kinda high tech for an abuela. As the ferry approached for us to board, the whole building filled with a low hum. Imagine the engine room of the Death Star and you’re got it. Our Sea Cat took us smoothly across a dull brown waterway that seemed to be supporting a dull silver and gray sky. Only the land in the distance had any color, and that was a dark grayish purple. The ferry is 28 seats wide, but we got a window seat. On two different occasions, a young woman sat next to me for nearly 30 seconds before getting up and moving somewhere else. The guy who occupied that seat for most of the trip had a little too much cologne on, but it dissipated by the time we disembarked. Once on land, we headed up to the info booth for a map, but we had to wait in line for one. In front of us is a woman who should make all American travelers cringe. She’s the “YOU DON’T SPEAK MY LANGUAGE, SO I WILL TALK LOUDLY. AND. SLOWLY” lady. And she’s doing this to a woman who spoke English remarkably well. 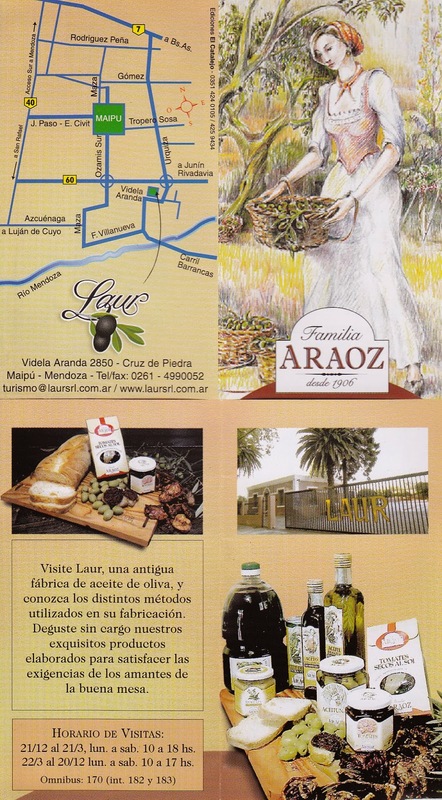 We walked down Gral Flores to a place on the water called /yelp?/ La Luna. I got the address from the info lady. Our meal was steak, fries, bacon, and fried egg…which is apparently a local specialty. We also had some sort of white wine sangria. This place is like an anti-Buenos Aires. There’s maybe one vehicle on the road, no crowds, and very little noticeable garbage. In fact, it took a concerted effort to even find a garbage can because they aren’t standardized. The best one is the 50-gallon drum on its side and cut in half, then mounted on legs. I got a mint helado as we walked around the old district. Cobblestone roads gave way to roads cobbled together from stone. It was like a riverbed in some areas. The sun came out just as we started walkig around. We followed the shoreline boardwalk around to Rivadaria and decided a shady, green walk down a pretty street would be nice. The homes here have Spanish and Portuguese influence, for the obvious reasons. We came to a small park and craft fair where they were selling the same stuff as on Flores. At one of the last stalls we looked at, we caught a whiff of something so bad we were compelled to check the bottoms of our shoes. The salesperson laughed and said in Spanish that we were okay and that the smell was the cheese in the next stall. But there’s still plenty of poop on the ground here. A little more walking and we rounded a park. Then we heard something like a stampede on the hill above and behind us. Turning around, we saw dozens of young teenagers running towards us. We wisely stepped off the sidewalk and let them pass before continuing on. But then they turned around and came straight at us again! We were barely able to escape being trampled a second time and consulted the map to find another route that had some of the shade and scenery that this route lacked. We walked over to an alternative info booth attendant that didn’t speak any English to find out where the buses stopped. I got the location, but when I tried asking if this bus served the place we wanted to go, all I heard was ‘San Martin.’ We were’t sure, so we went back to the port to ask the info lady about the buses. She told us just how they work, how to catch them, and how much they cost. We went to the stop and caught the first one. For 8 URG dollars per person, or $0.25 USD…that’s a 24:1 exchange rate. The bus seems very social, with people waving to friends along the route. There were cloth curtains hanging over the open windows that kept the air cool yet draft free. We road the bus to near the end of the line, where it turned down the coast. 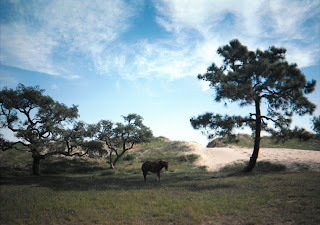 We walked on the beach where a small stream had cut a four foot bank in the dunes and groves. A wooden bridge with gaps large enough to fall through crossed the trench and we had to cross it, for no other reason that because it was there. There was a small arts and craft store on the way, hawking the same stuff. I bought a very bitter grapefruit soda. We walked on to the horse track, and probably saw a half-dozen people riding within a 5-minute period outside the track. Maybe it’s cheaper than a car and gas. We stopped at the bullfighting arena that repetitively warned us not to enter. There is a technical institute at the same corner, but we didn’t go in. The bull ring is in the middle of a large roundabout, kind of cool placement. We came to a church that was built in the 1700s, kind of dark inside. After that, we caught the bus back into town. This is a different company than the other one we rode, as one company runs on the half and whole hours, the other at a quarter past and a quarter to. The driver didn’t collect our money, but waved us to the back instead. We sat down and another guy came up to collect the fare. A bus conductor? Really? We hopped off the bus nearby where we had lunch in the historic area. We did a little more shopping before heading back to the port. While in Colonia, I paid for things with Uruguayan Pesos, Argentine Pesos, and US dollars…one time even using two currencies for one transaction. And they took US change, which was kind of weird. We also bought the worst empanadas we’ve had on this trip: they weren’t even warm. I still ate two of them because I was hungry, but threw one to a dog that had followed us from the empanada stand. We were finally able to ditch the dog when it stopped to wash the bad taste out of its mouth with water from the gutter. We weren’t in a gutter-drinking mood, so we bought churros, which are fried dough pastries. I had nearly finished mine when I noticed that it had a line of dulce de leche on it, like how hot dogs in ads have that curvy line of mustard on them. I told Kacey, who laughed at me because my dark blue t-shirt was covered in white powdered sugar. I brushed it off and then pointed out that she’d spilled the caramel colored topping on her blue jeans. These are seriously messy treats. We made it back to the port where we used the restrooms and sat down for a few minutes before noticing that the facility was awfully empty for having a ferry leave in an hour. I asked about it at the desk and was told the boat was two blocks down. Just out of view from where we were, cars had assembled to board a ferry many times more massive than the one we’d arrived on. It’s going to take a while to get back to BA. We checked in and each had to pay a departure tax of $5 ARG each. Went into immigration where they asked for a form we didn’t think we had. It turned out to be part of our boarding pass. We walked up the ramp into the terminal only to turn around at the top and walk down again. We stood there for 15 minutes or so before boarding the ferry. The sun was just setting and the sunset was a golden brown that I’ve only seen once or twice in French Impressionist paintings. The water was a glistening black and reflected the fading light while the disappearing land turned black and separated reality from reflection. The whole scene was framed in the wide open white window openings of the ferry’s loading bay and surrounding dock area. Pic of monet with white border? Our seats are in the back of the boat, because we got there early enough to pick them. They recline and look like first class airline seats. As we pulled away from the dock, Colonia’s lights shone brightly between the black sky and black water, like a star that fell to Earth and scattered on impact rather than splash into the sea. Back inside the ferry, I fell asleep at one point and when I woke up, two guys were standing in the aisle looking out the back window and Kacey was elsewhere. I checked my bag, it was still tied around my foot. But talk about disorienting. The three-hour ferry ride had that same white noise engine hum as the Starship Enterprise. Well, it did up until there was an announcement that probably said something like “Do not be alarmed, the ship is tearing itself into smaller, less buoyant pieces.” As soon as the announcement ended, the thrust reversers or something kicked in and the boat shuddered and shook. If people were sleeping, they probably woke up really quickly. We pulled into the harbor and disembarked with the crowds. Just before we got to immigration control, a uniformed old man signaled to us to step out of line. I thought that he just wanted to check my bag, but he just waved us around the inspector’s area. We weren’t sure if our passports showed that we were here legally, but they had been stamped in Uruguay. We walked up to Calle Florida and back to the hotel. All of the stores were closed as it was after 10pm. Before we got back to the hotel, we stopped at a McDonald’s and I totally forgot how to order in Spanish. It seems my Spanish skills have been decreasing since arriving in BA, since so many people speak English to us. Back at the hotel, however, this was not the case. They speak very little English. To end the day, I tried to get some more toilet paper since our roll ran out early this morning and the maid didn’t replace it. The maid service shut down at 10pm, the front desk didn’t have any, but did “make a note to call first thing in the morning.” Great. Fortunately, we had some tissues in our bags in the meantime, since it’s clear that nothing else is going to happen on that front until daybreak. 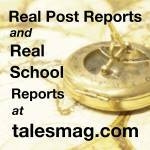 To read all posts from this trip in chronological order, click here. We barely made it in before they stopped serving breakfast at 10am. When we got to the dining room, it was packed full of people. The sun was shining in through the window. It was like having breakfast in a greenhouse, made less enjoyable by all of the noisy people squawking away and the lack of any real air conditioning. There was only a small wall unit that didn’t even put out enough to cool a single table (ours, as luck would have it). We walked down to Plaza de Mayo again, and there were even more cops out today. We walked by the spot where some teenagers had been filming their skateboard stunts yesterday. We’d stayed just long enough to watch one of them wipe out on some stairs, in that classic fashion. Instead of skaters, today there was a woman selling the creepiest hand puppet I’ve ever seen. It looks like a baby, but doesn’t move like one. I don’t know how else to describe it. We walked over to San Telmo for another art fair / antique sale, where we saw more creepy baby puppets. We also stopped into a number of shops, and found a wedding present for my fraternity brother Jimmy. Which is very timely, as I’ll be headed to the wedding at the end of the month. It’s a silver-plated pitcher with a decorative trim. The outdoor market is very crowded, and the smoke and incense are getting to us. The road is littered with street tango dancers and little boys playing accordions. There’s also your ubiquitous street artist who thinks wearing a costume and standing still is art. One guy did have a fountain as part of his act. I think that he had a hose running inside his outfit. Breakfast was on the 7th floor, in the hotel lounge. It’s sort of an odd location, but I guess the homeless folks we keep passing might try to scam them. Tonight’s tango show and dinner cost $300 in cash (or $100 USD), so we had to hit the ATM again. We were out the door by 9am, and headed to the Plaza Congresso. We’d intended to see the Teatro de Colon first, but got ourselves turned around. We arrived at the Teatro at 10:30 am and barely made it on the English guided tour. In the group, there was a kid who looked like the Lacrosse-playing, Abercrombie-wearing, boarding-school “too cool for this” kind of guy. His attempts at humor were rather lame. Our tour was occurring during a stage lighting rehearsal, so when we were actually in the theater it was dark except for the stage where four actors stood motionless as their lighting subtly changed. We sat in the President’s booth, as it was the only one big enough to hold the tour group. We were also treated to a private performance by a flutist dressed in a costume for a royal court: golden vest over a white ruffled shirt, gold pants, and a ponytail. While I’m thinking of it, Argentine hairstyles are somewhat funny. The guys seem to be going for the long-haired, romance novel cover boy look, but are closer in execution to having a bad mullet or roadie hairstyle. As we descended to the backstage and practice rooms, we became aware of a little girl in our group. She was having some trouble with the several flights of stairs leading down into the labyrinth beneath the theater where the dancers were rehearsing. They weren’t dancing just yet, but some of their super tight outfits had already stopped being flattering. I guess they could have been going for “ballet cool,” if that’s a thing. We also saw where they make and keep all of the costumes and shoes for all of the performers. Lightweight materials like ping pong balls and Styrofoam painted with metallic paint are also used to as alternatives to actual metal. But either way, this place is a serious fire hazard. Some of the costumes are so old they can’t be worn again. We also visited the backdrop studio, the metal working studio, and saw two of the dance studios where the little girl stood awestruck watching the ballerinas practice their routine. After we finished the tour, we bought tickets for the symphony next week for $18 ARG for both tickets, which is like $3 USD. From the Theatre de Colon, we walked over to a cemetery by way of Av. Alvear. Before we got there, we browsed an artist fair with typical handicrafts. By this time we were getting hungry, so it was more empanadas, this time on the very pretty Posadas road. Our waiter informed us that they had Pepsi, no Coke. 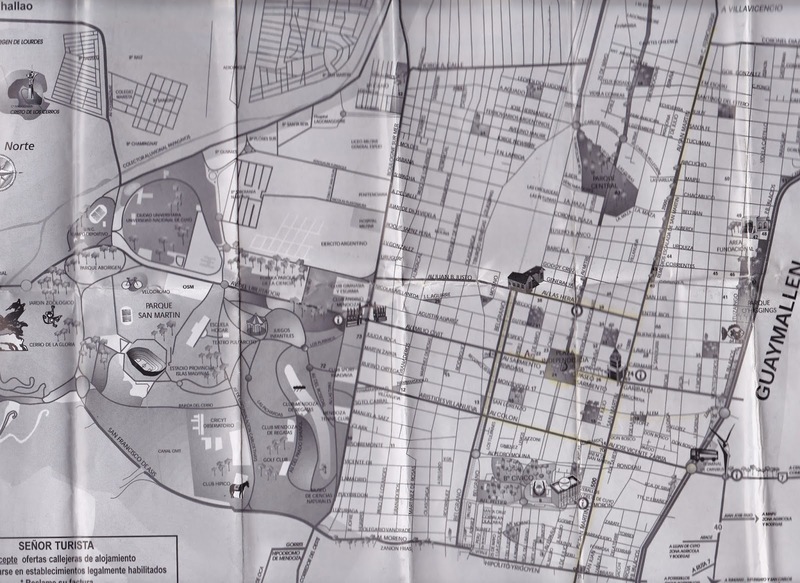 When we finally arrived at the cemetery, we ended up walking around the wrong way, nearly two-thirds of the perimeter. The walls are towering two stories above the street as the road begins to climb up the hill. There was an /link/ Eva Peron imitator with the soundtrack playing from her radio. We visited the grave of Eva Peron along with all the other tourists, after which we walked around wondering why some of these multi-story crypts were open to the outside. Kind of creepy in that “worst place to be on the /link/ Dawn of the Dead” kind of way. We kept on walking to the zoo and botanical gardens. I got some chorizo in a bun, then noticed that the cook’s left hand that he had been hiding under a towel was deformed by a birth defect that left only the joint with fingernails protruding from a stub, no wrist or palm. Not his fault he was born that way, but it’s really not an appetizing view either, which is why I think he covered it with a towel. The botanical garden had lots of trees (obviously) that created some much enjoyed shade. There were also dozens of cats as the park was closed to dogs. Buenos Aires (BA) is like an SAT question. BA: other places on our trip. One cat hopped into Kacey’s lap when we sat down on a bench. It was gray and fairly clean, but promptly went to sleep in her lap and was reluctant to let us go. We moved on to the metro, or subte, but found this entrance, the one by the entrance to the zoo and garden, closed on Saturdays. Hmmm. We had to walk around the garden again to find the open entrance. We rode to the Cathedral stop at around 4:15pm. There is a tour at 4:30 of the Jesuit catacombs, or so our book says. Kacey’s impatience and annoyance for the book’s lack of detail is brimming over since there is no specific location mentioned to start the tour. We spent 15 minutes canvassing four blocks looking for something like a tour group, but saw nothing except a Jesuit in a brown robe who said “We open at 5pm, there is no tour.” Which, after walking around frustrated and riding on the hot, stuffy, poorly ventilated subte is not what we wanted to hear, so we stopped into a coffee shop near the Plaza de Mayo to unwind and reorganize. We got milkshakes and cooled down. The dominant feature of the Plaza de Mayo is the Casa Rosada, where Evita addressed the people. It also happens to be one of the few places with monuments we’ve seen that isn’t defaced with spray paint or paint bombs. The other buildings, including the church, have communist/anarchist graffiti and the occasional “Maldives are Argentina’s” sentiments. They’re very determined on this last bit. We walked a few blocks back to the hotel where we refreshed ourselves before getting in a van to a go see the tango show at El Viejo Almacén, the city’s most famous tango salon. Dinner was included, we had wine and steak. And more wine. Then at the show, they put us up in the messanine and gave us champagne. Fortunately, there was a wrought iron railing to keep us from falling over onto the dances below. There were four pairs of dances, six musicians (2 violins, 2 accordians, a bass, and a piano). The dancers had crazy fast footwork and the ladies mostly had that stage-red dyed hair to complement their blue or purple dresses. There were also four musicians on traditional pan flutes and strings. They had native ponchos and played cover versions of /link/“The Good, the Bad, and the Ugly,” /link/“Rawhide,” and that Simon and Garfunkel song that goes /link/“I’d rather be a hammer than a nail…” We were also treated to a performance by an old woman with big hair who sang to us. I have no idea who she is. The emcee had a tux with a red shirt on and the place had a matching Cabaret vibe. We took the bus back to the hotel, where we discovered that our air conditioning wasn’t working. I think they turn off the circuits. It’s warm, humid, and generally verging on slightly uncomfortable. Because of all the alcohol, I pretty much fell right asleep. We probably walked 5-6 miles today. And we have a /blog/ busy day tomorrow, too. There isn’t even a switch on the A/C. You just have to plug it in. Today started relatively early, sometime around 8am. We had breakfast downstairs before heading back to the pedestrian walkway to catch the stores when they are actually open. We stopped in to buy stamps and mail postcards. Spend $60 on stamps for 15 post cards, which is about twice what we are paying for meals. What a country! We also found two disposable cameras and bought them, too. I think it came to $80 for both of them, but we definitely weren’t paying for quality. I hope they work out. We’re seeing all sorts of stuff that would have made a nice photo, too bad /link/ our nice cameras were stolen. A little before noon, we checked email and then checked out of the room. A call to the police station yielded a “We’ll call you if we find something.” It sounds so promising. The hotel hired a taxi for us to go to the airport. There were vineyards surrounding the terminal and two pilots walking around in them. All of the rows of grapes we’ve seen have roses on the end of them. I think they are being used as soil pH indicators, where the color of the rose translates to a certain pH level. We checked in for our flight about two hours early, there was no line at all. We had to get business class tickets because coach was full. Lunch was lomitos and beer, in the airport restaurant that really had issues with my credit card. It didn’t scan, there was no paper in the printer, etc. We’ve made it through our time in Mendoza with almost only our cash, the equivalent of $100 USD. Crazy cheap food. Gifts and hotel were on credit, but the tours weren’t. The wine tour was about $9 USD each. At the end of lunch, we found a huge line at the counter for flight check-in. We boarded our flight leaving from Gate 4 by using Gate 3. It seems that all rules and policies here are more suggestions than regulations. I spent almost the entire flight catching up my journal. We arrived at Buenos Aires around 4:30pm. Business class was nice. Kacey had champagne. And Tang. If she had mixed them for Tangpagne, that would have been white-trash gold. We had no problem getting our bags, but I threw out our claim tag and had to retrieve it from the garbage can to get out of the terminal with our stuff. We hired a remise, which is like a private taxi, for around $7 USD to take us to the Hotel Gran Argentino.We loaded up our taxi and a little boy nearly joined us. It seems that we distracted him from his mindless following of his parents. The look of “Who are you?” on his face when he looked up and saw us was hilarious. We sent him on his way to avoid a ‘Home Alone’ moment. I’m not sure if his parents even noticed. 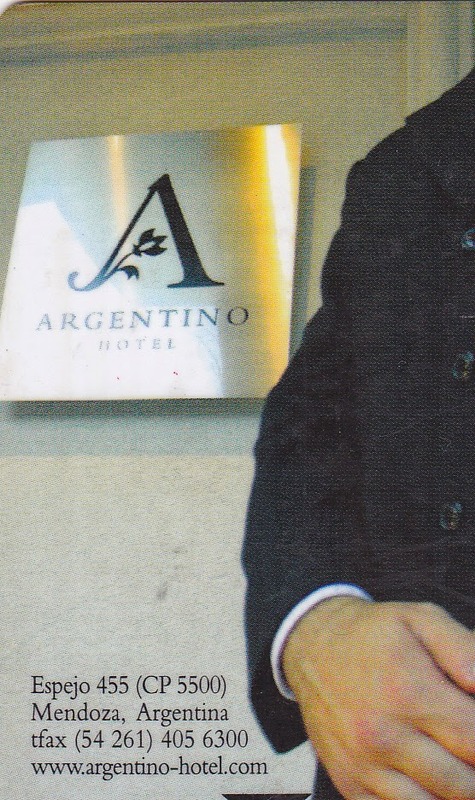 We checked into the Hotel Gran Argentino, and my first thought was that this place is old. They have a three-person elevator, rather cramped if you have any luggage. We booked a reservation for the /blog/ Boca Juniors game on Sunday , but I had to use my Visa card for the first time in a year because they don’t accept Mastercard. Our room doesn’t have the same feel as /blog/ the last hotel. This one is a little more worn. We went out to Calle Florida for shopping. It’s a huge pedestrian mall area. I bought a Boca Juniors jersey for the game for only $ARG 45, maybe $15 USD. We keep popping in to and out of stores to get a good idea of what they have: Copper plates, painted tango things, sports jerseys, etc. There seems to be only one or two unique stores and the rest sell the same stuff. But I guess that’s true in just about every tourist area. The lights are out of control. We’re so heavily bathed in bright neon and white lights that our shadows have shadows. We arrived at Plaza San Martin where we had dinner in a corner café. I had a pizza that was mostly cheese, so much so that I had to leave a good amount on my plate because I just couldn’t take it anymore. We returned back down Calle Florida and all of the street performers were gone. Senor Robot, an angel statue, and a few more performers we didn’t watch because that kind of venue is prime hunting ground for pickpockets. It seems that if you are overheard speaking English, a beggar’s hand will surely appear asking to be filled. We got back to our hotel “suite” with no pockets picked, /blog/ for once. I think it’s called a suite because of the 8 ft by 8 ft entrance room with a chair and side table. And that’s how our day ended, and where my inner geek emerges. I filled the sink up and let it drain, just so that I could watch the /link/ Coriolus effect in the Southern Hemisphere. In case you’re wondering about the women of Buenos Aires, here’s my take. Besides being much shorter than me (by 12-18 inches), not many of them are all that attractive to me. They often wear tight jeans that look like they need a pit crew to change out of. Some of them have nice figures that they’re flaunting, but many of them are trying to squeeze into styles not meant for them. Kind of like back home, there have been a few head-turners but most of those are because of how nicely their outfits complement them. For being the “Paris of South America”, you would think fashion and beauty would be all-pervasive. Not so. Many of them look artificial, “trying to stay in the race,” if you will. Some should be retired. To be fair, I don’t know if they are also tourists. I’d say they have the same percentage of attractive women as any other major city, but dress in a way to catch guys’ attention. And I can tell you that all the guys are looking. It’s part of the culture. But that doesn’t mean it’s best for society and equality though. It’s a new day. It’s also 11 am, and I’m just waking up from our /link/ long night of undesirable experiences. We mobilized fairly quickly to get some food in our stomachs before the wine tour this afternoon. We walked down our street to San Martin, where we exchanged our remaining Chilean Pesos and then looked for a restaurant. There’s a McDonald’s at the corner, which sounded pretty good as comfort food goes. Both of us still have a queasy feeling from last night, made worse by skipping dinner and not having much breakfast. I’m now very glad that I brought my Tums along. We had lunch at a café called /yelp/ San Pablo, which sported a very ‘80s mirror and wood theme. Even being a little sick to my stomach, hamburguesos con papas fritas still sounded good. They came in two sizes, and having not eaten in a while, we got the larger ones. The unique thing about these burgers is that they came with a topping of fried egg and—like everything else here—a slice of ham. Neither of us could finish the meal, there was just so much food. We walked back to our hotel, arriving at 2pm. All of the stores were locked down tightly with metal grilles along our walk back, even though it was the middle of the day. “We don’t want your business” is their motto. Checked email until 2:15 when our ride (who was due to arrive at 2:30) showed up. Time really seems to be more of a suggestion here, unless it involves taking a siesta. Our driver took us around to pick up other tourists, including a Danish guy named Christopher, a Dutch girl named Monica who was tall and skinny (but even so I didn’t think she was very attractive), and a couple from Cordoba in which the guy had a voice that reminded me of “Bob Esponga” as Spongebob Squarepants is known here. It should be noted that we are the only ones in the group who aren’t fluent in Spanish. One the group was assembled, our first stop was to a winery (bodega) that specialized in Malbec, the local specialty. Monica translated a few of the comments for us, but we were able to work our way through on our own. The hostess of the bodega also spoke some English. Back inside the winery, we tried some sparkling wine and Malbec before reboarding the bus. We drove on, then turned around and took another road. A wrong turn at the roundabout and we were at an olive grove. The olive grove staff showed us (rather than told us due to the language difference) the old and new ways they make olive oil and olive paste. You couldn’t escape the smell of olives in the grove, or the light film of oil on all the floors…even in the gift shop. Both of these places had a refined Napa Valley winery feel to them, so our third stop was quite a shock. We were driving down a road with high fences and walls with buildings behind them. All of a sudden, we turned into a gate and then around the back to a dirt courtyard that had everything you’d expect a drug cartel headquarters to have except for Danny Trejo and some heavily armed guards in sunglasses.There was a large warehouse with wooden doors and stucco walls, neglected facilities, a few random process equipment like wine tubs were sitting empty next to pulp on the ground. Then an old man came out of the office that was built onto the side of the warehouse and led us on a tour of the fermenting tanks. This building looked like a leftover Soviet chemical/biological experimentation lab flown over when the empire crumbled. All of the epoxy was falling off, everything was damp, moist, and grimy. We climbed a set of stairs to gain access to the top of the tanks, where our guide said lots of stuff I didn’t understand. Then his assistant brought over a hose and I heard a pump kick on and wine flowed from the bottom of the tank through the pump and out of the hose to form a frothy layer over the dark burgundy mass of cabernet sauvignon in the tank. From our vantage point on top, we descended two flights to the cellar where we tried a number of wines in various stages of readiness. This area of the winery really had the “forgotten insane asylum” feel to it with gray-green walls and dim lighting. The wine was okay, but will age for a few more years before being sold. By this time, we’ve all had five to six glasses of wine each. Kacey made a solid first impression with her first glass, which she chugged while everyone else was just standing around looking at her like she’s an alcoholic (which she’s not). The next and final stop on the tour was a church and a nearby empanada stand. The church was a small town, thick-walled place that would fit in perfectly to a prelude to a fight scene in some modern western movie. I expected the doors to open at any moment to see Antonia Banderas backlit with some menacing theme song swelling in the background. The empanada stand was in a house that seemed to have one wall that bounded the perimeter with a post in the center supporting the roof over the tables where a hundred clay lanterns were being sold. I was already shutting down by this point, not because of all the wine (which probably didn’t help), but rather because of Senor Spongebob’s ceaseless yakking behind me in the bus. It was like having 6-penny nails hammered through my skull and then cut off with a hacksaw. We survived the mouth-burning empanadas and made it back to the hotel. Later, we walked down a neighboring street where the arts and crafts stalls were set up in the median. Kacey got some sandals, then we walked some more until there were no more craft booths. But there just so happened to be a brightly lit and inviting store on the corner, so we decided to have a look. More arts and crafts, but of a higher quality that the stuff on the street. We found the wine we had at dinner the /link/ first night in town, and I bought a /link/ wooden llama and clay nativity set. They also had a wine coozie(SP?) made from a cow hoof, but I decided to pass on that one. We dropped our stuff at the hotel and walked through Plaza de Independencia and the pedestrian walkway before heading over to Villanueva for dinner around 10pm. We’re on the local schedule now, so things are nice and lively. Stopped at a fairly generic bistro where I had some ravioli in meat and wine sauce. They have to work in the wine somewhere. While we were eating, part of the wall fell onto another patron. Well, maybe not “fell”, but swung out an hit him on the head. It seemed like your everyday wallpaper and lighting ensconced wall, but must have been an access panel that decided to break free. We walked back to the hotel, and there were still little kids playing in the park. Perhaps it’s because their schools only let out at 6pm. Yeah, we were on the wine tour when one school let out, and we were trapped in a sea of knee-high school uniforms. I still have to pack for tomorrow, but my washed clothes have all dried out now, so I’m good to go. I woke up at 10 am and didn't feel bad about sleeping in. I'm still a little dehydrated, so we walked out of our hotel around noon to get some food before going rafting. We finally got our voucher. We also checked out some of the available wine tours before leaving the hotel and reserved one with the same company that booked us our rafting trip. Even at noon, there is no one eating. I don't have any idea when they would either, as siesta is promptly at 2pm. So, we found a nice outdoor cafe and had some cappelleti (Italian for "little hat") pasta, which was like ravioli in a hat shape. Our empanadas weren't available--maybe the fryer wasn't hot enough yet--so I ordered what I thought was steak tips. It turned out to be tuna and avocado, but as odd as that sounds, it didn't taste too bad. It is on the menu, after all. We each drank two liters of water and our bill again came to $42. Since I've been paying cash because few places here seem to like credit cards, our reserves are dwindling. We headed back to the hotel just before 2pm, when the flurry of activity related to people getting ready for siesta began. We were ready to go on our trip a little after 2pm, but it wasn't until 2:15 that a guy with bikes on the roof of his car pulled up and apologized for being late and we were on our way. He was a very relaxed guy who was also friendly and practicing his English with us. We got outside the city and were talking about mountain biking and stuff like that. It wasn't until I reached down and adjusted my sandal strap that he asked if I had shoes to wear. I said "Why do I need shoes if we're rafting?" He had a puzzled look on his face: "The tour is for biking." We pulled over and checked my voucher, which said "Rafting". Actually, it said "RAFING". Apparently, there was another group that had hired him to bike, but they weren't out there when he arrived and our tour bus was late. He made some calls and confirmed this. We were only about an hour late when we got back to the hotel where the van with a raft on top was waiting for us. Oops. The raft driver looked like your standard action movie-casted "dude with short hair": A red bandanna, Oakley sunglasses and a sleeveless T-shirt. We hopped in the bus/van after he checked the voucher and we were on our way (again). We took almost the same route out of the city to the outfitter's place. They gave us water-repellent tops and pants to go over our other clothes. We hopped into a more jeep-like vehicle and drove a few minutes with the raft in tow. Kacey and I were in the middle of the boat, so we wouldn't have as hard a time with our commands...which were in Spanish. Forward was "adelante!" Back was "atras!" and left ad right were the expected Spanish commands. When our guide wanted us to paddle forward, he said it in a rolling "Adelan-Adelan-Adelante!" By the way, "atras" and "adelante" are the "back" and "next" buttons on Windows Explorer. The rapids were pretty small, but the other three folks in the raft were inexperienced, so it was okay. We shoved off into the river, not as cold as you would expect for water coming from the Andes. There was even loose algae, which probably grew in the reservoir upstream and got sucked out when the dam opened. The river has carved out a canyon about 30 feet deep and maybe 60 feet wide, but the low water level kept the river to about 30 feet wide. The most excitement came at a large rock by the canyon walls. Our guide was trying to surf the rapid. We missed, but pulled the raft out and portaged upstream to try again. We failed again. Then we went a little farther downstream and pulled over. Our guide indicated that we should follow him, so we did. Through a waist-deep tributary. Then we stood next to that same rapid while he said some stuff in Spanish and hopped into the river and floated down to the raft. Not surprising since he also had all six of us stand up together in/on the raft while it was in motion. We both hopped in with only the life preservers keeping us up. It was quite refreshing to float in the river, but only lasted about a minute. So when he asked if anyone wanted to wanted to go again, we did. All around, you could see the Andes towering over us, rising so much higher than the horizon. We got back to base camp and changed clothes. The rafting dude drove the van home, with Latin alternative rock music blasting out of the speakers. How'd you fall out? I didn't fall out, I jumped in! We were back at our hotel around 6 pm and sorted all of our wet and dirty stuff to take to the laundromat two blocks away. We'd purchased the detergent earlier and the place stays open until 8pm. They use laundry tokens, but it only cost a couple of pesos for the washing machine. We threw all of our stuff into one machine to wash, then two dryers. We sat there writing in our journals...as good of a time as any, right? I worked pretty much uninterrupted as there were only a few people who came in. As we were pulling out our dry and mostly dry clothes, Kacey noticed that her camera bag was missing. We looked around briefly before realizing that a guy had come in and asked us a question in Spanish and then walked out. The classic distraction. That was 20 minutes ago. We talked to the shop owner and they were shocked that that had happened. We asked them to call the police and after the third pass-by the patrol car found the place. Ahem. Let's just say that something like a laundromat is hard to miss even the first time, and cops don't need to look for parking. The officer took our statement, with the help of the shopkeeper. The officer then asked us to come down to the station to file a claim. The back of an Argentine police car isn't designed with comfort in mind. Even though it was a VW Jetta, the seats had been replaced with a hard plastic and I could barely fit my feet on the floorboard under the driver's seat. The whole rear passenger section is encased in a wire mesh intended to keep someone from breaking out the back window to escape or into the front to change the radio station. We arrived at the station amid flashing lights that lent to the atmosphere of a high energy dance party. We even had a nicely dressed officer open our doors for us like we were celebrities in Hollywood. This was probably due to the fact that the doors don't open from the inside. We were led to a bench and told to wait for someone to take our story down. We learned this from a guy standing by us who was nice enough to translate the process. He also informed us that in the entire city's police force, only 3 officers spoke English. Which is always something that sounds, um, inspiring? We wouldn't expect all the officers to also speak English, but 3 seems kinda low. Kacey's holding together quite well considering that this is the second time this week she's been a victim of theft. The first we now believe to have occurred in Punta Arenas, because the maids opened all of the doors in the place to air it out...including the one into the street. Her stuff was closest to the door. Our "English-speaking" officer's English was as good as my Spanish, which is to say, elementary at best. I literally had to draw him a picture of what was stolen, how the scene was set up, how it played out, and details of the culprit, etc. I felt like this was the culmination of all my project design drawing classes and Spanish lessons. About two hours later, we finally finished up and were told to wait just a little longer for our copy of the report to print out of the dot-matrix relic they tried to use as a printer. I don't mean to imply that they don't seem to have their act together, rather my intent is to give you examples of how they don't. Perhaps it's the fact that they didn't take down any contact information for us, if they did stumble across the camera whose detailed model number description I gave them was reduced to "Canon camera". Or how the interviewer walked by a half-dozen times before he said we could go, but instead of calling us a cab, had a police car take us back. He led us to the car, we got in, he closed the doors and walked away. So our second ride in an Argentine police car began by waiting for what seemed like 15 minutes in the back of the only patrol car double parked in the street outside the station. People passing by must have wondered what we'd done. After a while, our first officer on the scene (who hadn't gotten the story to our interviewer, see "have their act together", above) rode shotgun while the driver took us back to our hotel. We were helped out of the back of the patrol car while the classily dressed hotel staff looked on in what felt like haughty supremacy. But wait, don't they work at a hotel? Back in our room, we now addressed the sinking void that had developed moments after the realization that the camera and all the photos of our trip to date were now in the unappreciative sticky fingers of some petty criminal, save the ones we took while rafting with a disposable waterproof camera. All of the beautiful photos and chance sighting are now nothing more than memories we can only share through words not designed to express such awe and beauty. Fortunately, Kacey's journal was in-hand (not in the camera bag) so she still has her thoughts on the trip, even if they are now tainted with the unfulfilling acceptance that there is more chance of finding our cameras (mine was stolen in Santiago) on a street corner at home than having them returned to us. Imagine the lack of trust I now feel towards everyone whose eyes cross over me, potentially appraising the quality of prizes I might offer, should they decide to take away something from me that I care about but means absolutely nothing to them except another quick score. Woke up in Santiago around 5:45 and were on our way to Mercado Central around 6:30. It was about a half mile to cover, but we still arrived a few minutes before 7 am when the place opens to replace the /blog/photos we've lost on this trip. Took a few exterior photos and tried a pastry from a nearby panaderia. First time I read the store sign, I thought it said “Pandaria,” like a place where the specialty is panda steak. We walked from there down 21 de Mayo, through the Plaza de Armas yet again. Took a few photos in the still, morning air then headed back to the hotel. Ate a fairly satisfying breakfast (we’d built up an appetite with all that walking) before checking out. On the metro to the bus station, we saw an ad for cell phone coverage in the Chilean claimed slice of Antarctica. Brings to mind a version of the Verizon ad: “Are you freezing now? Good.” That might be worth the roaming charges. At the bus station, we found our platform with no trouble, but the bus was bound for Copiapo in the north, about 400 miles away. We asked someone in a bus driver-looking uniform and pretty much got across the idea that ours would be the next bus after this one. And sure enough, it was. We loaded our bags into the bottom of the bus by giving them to an old man who deftly scurried beneath the passenger cabin with them. He loaded each bag after putting a claim tag on them, but I saw my tag fall off just as it went in. So I picked up the tag an politely (and probably incoherently) asked him to put it back on. He gave me a look like I was speaking Chinese, but I showed him both parts of the tag. He took his part and disappeared into the bowels of the bus again. We boarded the bus after showing our passports and we were on our way. Folded down the lower leg rests as the bus pulled out of the station, and so settled in for the 100 mile trip (as the crow flies). The actual trip duration we expect to be around 6 hours, since we have to cross the freaking Andes. I can’t express quite how big they really are, but from the plane they looked level with us well before we landed. But back to the bus trip: Less than two minutes after pulling out of the station, we pulled into another station and sat there long enough to write today’s journal up to this point. I forgot to mention that the Mercado Central, while open at 7am, really doesn’t get going until 8am. We weren’t going to wait that long. Markets they open always seem to bristle with excitement and expectant energy. Only one or two fish stands were open, but one on the corner looked like they set up just for our photo shoot. Inside the market building, all the restaurants were still packed up from the night before. All the pushy waiters (and everyone else for that matter) were absent, but having /link/blog experienced it a few days ago, you could almost hear the flurry of activity and visualize the blur of the bustling crowd all around us. We rolled out of the bus stop #2 at 9:15 am. 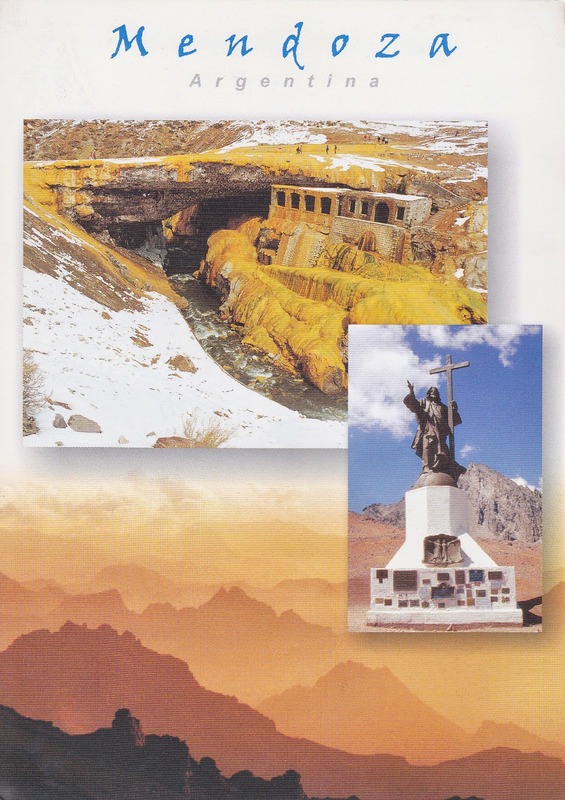 We drove for an hour or so, until we began to enter the Andean foothills. The land gradually became more verdant, then slowly browned out again. Climbing ever higher into the mountains, we started a seemingly endless series of switchbacks. At their most coiled, there must have been a dozen switchbacks that were practically stacked vertically upon each other. The mountains are covered in a fine powder that is being kicked up by the winds channeled through the valley we’re in. Peaks to the left of us, peaks to the right of us, peaks to the front of us, and peaks to the rear of us. If they were cannons, this could have been Crimea. Ruta 60 on the Chilean side of the Argentine border. Just before we reached the border, we passed under the “Welcome to Chile” sign that must be installed backwards. We entered a tunnel in no-man’s land. It was a two-lane tunnel, with traffic in both directions. The on-coming semis were barely visible through the smog trapped in the tunnel by the lack of any ventilation. Our bus submerged into the exhaust cloud moments after the steward secured the fresh air vent in the roof. It was like he was battening down the hatches to dive 10,000 leagues under the sea, only we were at 10,000 feet above sea level. We passed into Argentina at 11:40 and did the customs shuffle. The fresh mountain air, bright sun overhead, and rejuvenating cool mountain breeze were just perfect. On second thought, those things also sound like scent names for hygiene products, which would be appreciated on this bus with minimal air conditioning. The customs process consisted of us having our bags pulled off the bus, set on a conveyor, scanned by an X-ray machine, and then having our bags reloaded. I fell asleep sometime after that. A little while before I nodded off, we passed through a number of tunnels that cut through the side of the mountain. My entertainment was watching to see where the train tracks were. It was rhythmic and almost hypnotic, the way they sometimes paralleled the road, sometimes below us, and even a few times running along the other side of the river we were following. Which, coupled with the sun, might explain why I woke up outside of the tall skinny trees that introduced us to Mendoza. The trees here are awesome. Every street has just the right shady covering. The parks are full and green. While the air is dry (and polluted), I would hate to see it without these natural filters. My mental image of Mendoza before arrival was that it was nestled in the mountains with dirt streets separating white stucco houses with red roofs and wooden trim. It’s a much bigger town than we had expected. At the bus station, the baggage handler for the bus would only hand you your bags if you tipped him. There were maybe a half-dozen hotel reps circling the recently arrived, but since we had reservations they left us alone. We found an ATM, then information booth. The woman in the info booth spoke enough English to explain how we could get to our hotel. We met another pair of English speakers who were asking the same questions, so we listened in. We looked at the map of the city and decided to walk the 10 blocks to hour hotel. The first few minutes we were still getting oriented, but we found our way without incident. There are a number of natives smoking up in the blocks around our bus stop. The people here seem a little more diverse than in Chile, but we still stand out. The traffic is decent, but a red light seems more like a suggestion. At our hotel, the /link/ Gran Argentino, we look terribly under-dressed for the occasion. It has a very polished atmosphere, not elegant, but classy all the same. That’s the lobby, anyways. Our room is small, with a view of the barrio across the abandoned field. I made reservations for /link/blog rafting tomorrow, they’ll be by tonight to collect the money. Back in the room, we watched a little TV, waiting until we got hungry, which was around 7pm. Since the rafting collector didn’t show, we left money at the front desk. It seemed like the guy at the desk was new, since putting the money in an envelope was an after-thought. We ran into the people that we eavesdropped on at bus station in the hotel lobby. I guess we could have just followed them out of the station. We walked away from our hotel, through the Plaza Chile, which was fairly nondescript except for the fact that it, like rest of the town we’ve seen, prefers tiles and pavers to poured concrete. There are irrigation canals around every block, up to a meter wide by a meter deep. I read somewhere that the Incas brought water here through irrigation canals a long time ago. But there is a trick to crossing them: you have to find the right point with enough light, all while trying to avoid getting hit by cars that are an emissions regulator’s nightmare. You know that smell at go-cart tracks? The tiny engines give their best impression of that sound as well. 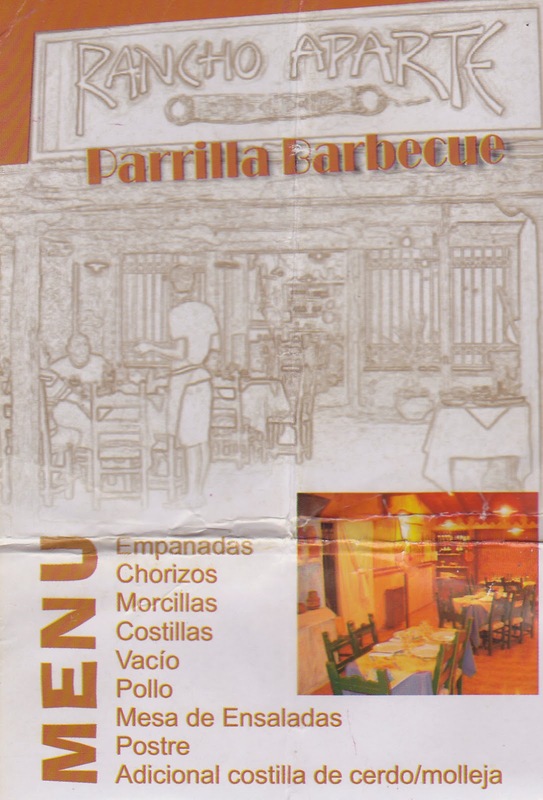 Around 8pm, we arrived at /yelp/ Rancho Aparte, a Parrilla Barbecue, that we had the ad for. The outside was lit, but no one was around. They said they were open, but the interior was so dark that its ambiance went straight to “locked in a cellar.” We asked if later was better, and were told that it was, so we went looking for a coffee shop…in wine country. Along the way, we stopped in a meat store, an outdoor outfitter, and a pharmacy before killing some time reading the newspaper for local events in the cybercafé nearby. At around 9pm, we saw another group eating at our restaurant, which looked much more inviting now that the lights were on. We ordered from, well, absolutely no menu, and said that we wanted the barbeque. It turned out to be a sampler, with empanadas, tasty chorizos, marcillas (which had the unnerving consistency of liquefied meat), straight cuts of steak, cross-sectional cuts of ribs, and chicken. The hostess asked us if we wanted to try more stuff, I think it was tripe and feet. Didn’t eat much of that. We also had some of the extra meat still on the grill, flan, a really fresh salad (first in a while), and a bottle of a local Malbec. Our bill came to $42 ARS, which was about $14 USD, total. And our waitress was bad at math and nearly gave us back $10 ARS. We were almost finished with our dinner at 10pm, when another group (third of the evening, including us) arrived. 10pm is the dining hour here. Back at the room, we stayed up until midnight to get into the social cycle. Also, the idea of renting a car to go to a vineyard became less and less appealing as we saw more and more flagrant driving violations. It would be too dangerous to navigate out here, and I’m not sure my license is even valid here. I woke up with the alarm at 7am, got dressed and had breakfast. This is the first time that we weren’t the last folks to eat. Placements and food were set out at all of the tables. From 0900 to 1015, I kept checking to see if the hostess was around to check out of our room and arrange transport to the airport. I ended up asking the woman who cooked us breakfast to do this for us. The three nights ran $75,000 or $120 USD. All this time, Kacey was out in the rain mailing a post card and finding out that the stores didn’t open until 10 am. We packed up our stuff and waited for the transfer driver in the lobby. While there, the Canadian woman from yesterday came out of the hallway and said we looked like the farm couple in American Gothic. I don't see the resemblance. Photo taken in Chicago during my 2002 Road trip. I guess we’re not the cheeriest folks out there, but Ms. Canada was more chipper than average. Checked our bags one last time as we out them into the minivan to the airport. We made sure we buckled up, because this was the /link/blog same driver that we nearly got in an accident with the other day. The weather is rather nasty, causing the parks to flood and rivers to surge. Cold, wet, and windy is how we left Patagonia. The LAN Chile agent spoke English well, so we asked for a seat in the front right of the plane (for the better view). Unfortunately, the sky was solid overcast that was painfully bright from the sun’s reflection. So no good vistas of the mountains. Which is okay, since /link/blog we saw them coming in. During the in-flight meal to Porto Montt, I got Kacey with one of the oldest practical jokes known to man: “Does this smell sour to you?” Our dessert was a creamy square cake, obviously dairy based. I was a few bites into mine when she started to unwrap hers. Before she got her fork into it, I convinced her that she might want to check it to make sure it’s still good. She held it up to her nose and my left hand applied just the right amount of pressure to her hand to put a dime-sized, nose-shaped dent in the top of her dessert. Fortunately, it made her laugh, because she knew that she knows better, but I got her anyways. Now I’ll have to be on guard about waking up without my eyebrows, but I still think that it was a textbook execution of that particular trick. The overcast broke just before Porto Montt, where a huge rainbow arced from over our wingtip to some point below us. We landed and refueled without deplaning, /link/blog again. I’m not sure what happened next, since I woke up at altitude just as the food cart was coming by. The sky’s cleared up a bit and we can see the snow-capped Andes in the distance. At first, we confused the peaks with the clouds, that’s how high they are. Sort of dirty brown up to the snow, but they blend in with the smog remnants so that it’s almost impossible to tell where the mountains begin and the valleys end. But the jagged and rough white peaks tear open the bottom of the bluing sky. We picked up our bags and caught a transfer bus for $6,000, a far cry from /link/blog our first cab ride of $30,000. Which, I think it’s fair to say, was a swindle. But all the same, we still had to make our way through the taxi men perched like vultures in the outer terminal to get to the bus. We sat on the bus/minivan for about 5 minutes until we had a total of 4 different locations to go to. Mostly in the same areas that we had walked before. Check in to the /link/ (Vegas?) hotel, they had no record of the battery chargers being found. So we headed out on the town. Stopped into a Kodak store across from our hotel’s access road on O’higgins. Asked where we could find a battery charger. The cashier pointed west and said something like “Casa Roja.” So we kept that in mind and hit another photo store in the same mall. The sun has now set and the neon lights are brighter now. The second store directed us to Fuji. Along the way, we stopped in maybe four other stores, with no luck. The Fuji place directed us to Casa Royal, which was the actual name of the place the first store pointed us to. This time, we got the clerk to draw us a map. We followed it, but ended up in a McDonald’s where we asked a business women where Casa Royal is. We found it using her directions. It turns out that it was literally across the road from the hotel access road, maybe 50 meters from the first store. We stopped in /yelp/ Lomiton’s for 10 empanadas, fries, and drinks. My “Kem” drink was very pineapple-y. We stopped in to /link/blog Café Haiti for more coffee and snapped a picture of /link/blogpage RRR with the barista. Then went over to /link/blog Café Caribe and did the same. They were a bit reluctant, but all their coworkers egged them on. Good old peer pressure. We strolled up to Plaza de Armas where we snapped a few nights shots that were on my camera /link/blog when it was stolen. Bad luck with cameras this trip. Also got a photo adorned with banners honoring Pope John Paul II, the same ones we saw going up on CNN. We walked back to the hotel, picking up a bag of roasted nuts and eating them all before we passed a Christian rock band performing in the street. We spent the rest of the evening checking email and internet at the hotel. It’s so much warmer here today, around 80F. Crazy warm. As far as I can tell, we can get replacement photos of all the photos we lost from /link/blog that first day of the trip before catching the bus tomorrow morning. Not a whole lot of sleep tonight, but if we start early enough, we should get it all in. Plus, we can—and probably will—sleep on the bus tomorrow. It’s been a full day, and ended well. I got out of bed around 9, /link/blog again, barely making breakfast. We found out that Pope John Paul II had passed away, and all the channels were covering it. I wrote down the events of yesterday until a little before noon. 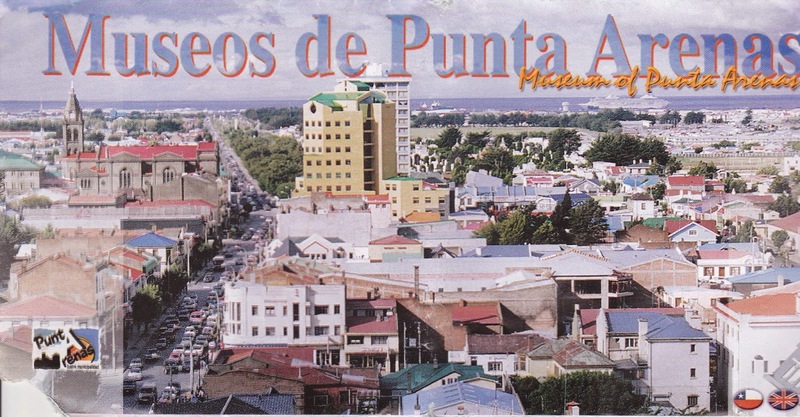 Over breakfast, a Canadian boarder let us know that some lady told her that a parade happens at noon on Sundays at the Plaza de Armas in Punta Arenas. We showed up there to find a whole bunch of soldiers in camo and berets carrying either musical instruments or weapons. A pass and review was all it was. I grabbed some cash from the ATM and headed to the /link/ Sara Braun museum; their house was built from mostly European stuff and it served as the Russian consulate until 1917. 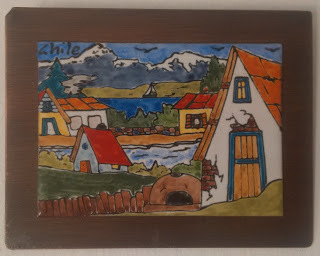 We went back to the hostel, but stopped at another store where I picked up a small tile with a Chilean seaside painted on it and mounted to a copper plate. We dropped our new stuff in our room and Kacey picked up the credit card and passport she left there. Well, actually, we went to the room, got the credit card, went across the street to the store, and went back to the room to drop off our stuff. The hotel cleaning staff must have thought we were crazy. From there, we hit /yelp/ Lomit’s, where I got a Lomito queso even though I didn’t know what it was. It turned out to be a slab of meat sandwich. Very tasty. We walked from there to the pier, which we were told would be open, but wasn’t. So we walked around a little more, until we found ourselves on a hill overlooking the city. A fairly nice view, with the wilderness on the opposite side of the water from us. We then strolled over to the Abu-Gosch Hipermercado (which sounds like a prison in Iraq on speed), but was only a grocery store. We picked up some snacks for our bus trip in a couple of days. They might last. The store was playing some music I recognized, like muzak versions of lounge songs, which reminded me that the song in the background /link/blog when we found out we could see the penguins was REM’s “Shiny Happy People”; quite fitting really. After the shopping trip, we got some chocolate ice cream cones to eat on our way back to the room. Once there, we relaxed in front of the TV. After a while, I suggested we recharge the camera. Kacey went looking through her stuff for the charger, but 10 minutes and piles of clothes later it appears that we left it in the room in Santiago. Fortunately, we still had the number for the place we stayed at and were staying in tomorrow night. I went through my Spanish-English dictionary and wrote a description for our hostess to use when she called up there for us. It seems they found a random phone charger, but not our camera charger. But after telling Kacey that, she says she’s also missing her phone charger, too. So it might be there. We’ll have to wait and see. We went out for dinner just after 7pm, but most of the places we knew of were closed. So, we stopped in to an “As seen on TV” store that sells the same crap as back home. After that, we ended up getting out of the rain at the /yelp/ Zurich café, but it was just a name. a pint of Austral cerveza and a dish like nachos but with French fries instead of chips, cubed steak not ground beef, sliced hot dogs and cheese. So, really it was nothing like nachos. We went back to the room after that and watched TV. I don’t think that I’ve mentioned how bright the overhead lights are in the room. Only four of them, but they’re like miniature suns only 10 feet from my face. And after a decent pint, they’re that much more noticeable. It’s been raining for hours now, but it’s a light, cool rain. I won’t be running around in shorts, but it is somewhat refreshing. I’m still fighting a cold and runny nose, but the headache seems to be gone. Most likely it was dehydration. Also, I don’t think that I’ve talked about the trash cages on three foot poles that prevent the stray dogs from tearing into the bags. We saw a few try, but only one was successful. One last note for the night: Our hotel dog was not aware that he was so small, judging by his big dog demeanor.